Stephen Dalton is a recovering arachnophobe and his enthusiasm for his interest shines through in every page of this generalists' introduction to the subject of "spiders." 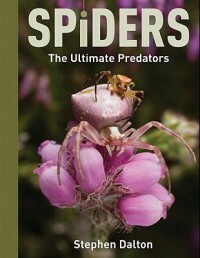 It's chock full of really cool photos, plus a nice little chapter at the end with tips on how to take pictures of the spiders in your neighborhood. The only objection a reader may harbor is that we only get to see a relatively small portion of the "kingdom of the spiders" - England, with some discussion of European and North American species.